Is that a Kiss Dispenser? You are here: Home / Adventures / Is that a Kiss Dispenser? 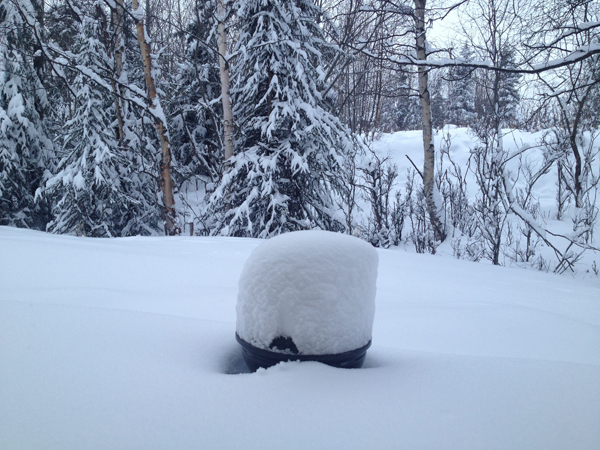 When I left Anchorage yesterday, it was on the tail end of 15 inches of fresh snow in my back yard. I had been thinking that we might get an early break-up and I would be able to pull the KLR out of the garage soon. Not so sure now. I think the fact that I was flying to San Francisco to meet with Jaz and screw around for a weekend helped. Spring is in the air, sort of. The snow on my back deck buried my BBQ grill this week. I like metal – Impala metal – around me in California. 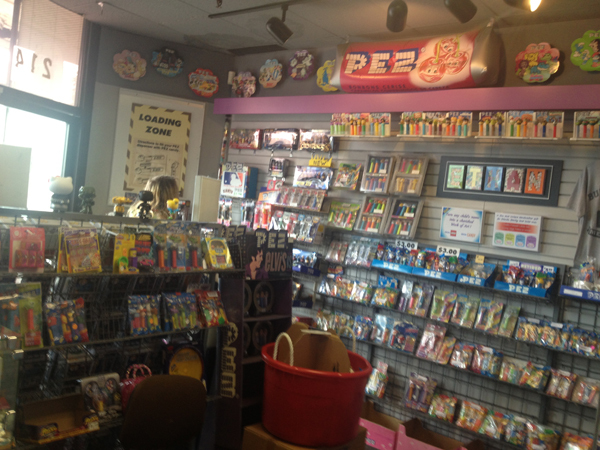 She picked me up at the airport and we headed over to the PEZ Museum on beautiful downtown Burlingame. Jaz retired over two months ago. She flew south. All those years of shoveling snow, and the first chance she got she flew. She has a second bike in San Francisco, and invited me down (she also ran out of Kaladi Trieste Blend, ground for French Press – I suspect she needed the coffee more than my company). 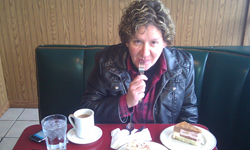 We talked about riding (me renting a motorcycle – because there is no way I would sit on the back of hers), and I did not want death by a California driver, or by my lack of navigating mine fields. We rented a car. Good thing. She has been riding down here for two months solid. She tells me “it’s like a video game, a high stake video game, you can and should pretty much do whatever you need to do to say alive. Pass a car on the right, pass a car on the left (when no passing lanes exist), split the lanes… whatever.” It takes nerves of steel to split a lane with California drivers at 70 mph. One mistake and your life is over. For those of you that do not know what splitting a lane is – imagine two cars driving side by side on the freeway. Then imagine a motorcycle rides up between the two cars and passes both while staying on the painted line. That is splitting a lane. 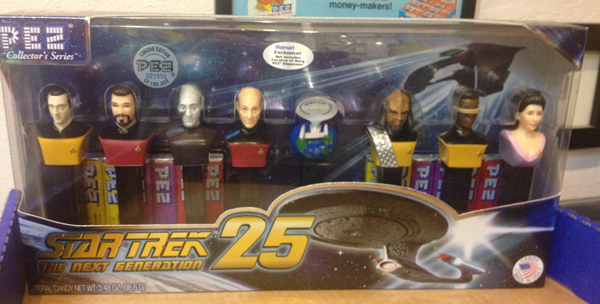 I collect PEZ dispensers. I have always loved them as a kid. 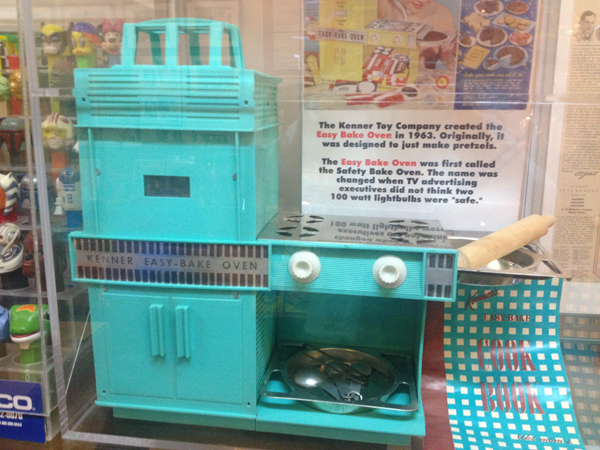 When I found out there was a complete museum dedicated to these wonderful little candy dispensers… well.. ROAD TRIP. 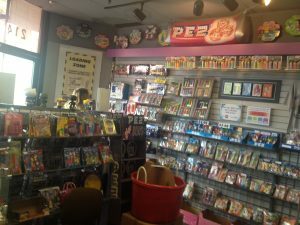 Not only does the museum boast an entire collection of every PEZ dispenser invented, the largest dispenser, but a pretty healthy gift shop where you can find contemporary and vintage pieces. PEZ Dispensers have been around since 1948; the actual candy was invented in 1927. 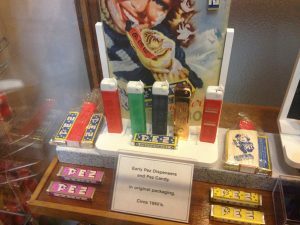 The original “candy” was a breath mint, and came only in peppermint (they were very similar to Altoids). It is considered the first breath mint. 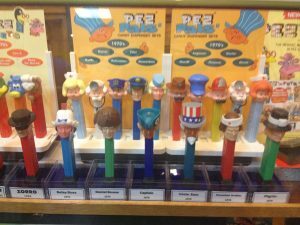 PEZ is not made in amerika; they are Austrian. The first dispensers were flat with no “heads” on them. PEZ still produces them, now about 30 new designs per year. 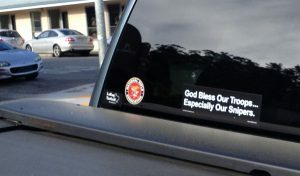 Not all are carried in this country. Jaz and I rolled in front of the museum. There are over 900 different PEZ characters to choose from. 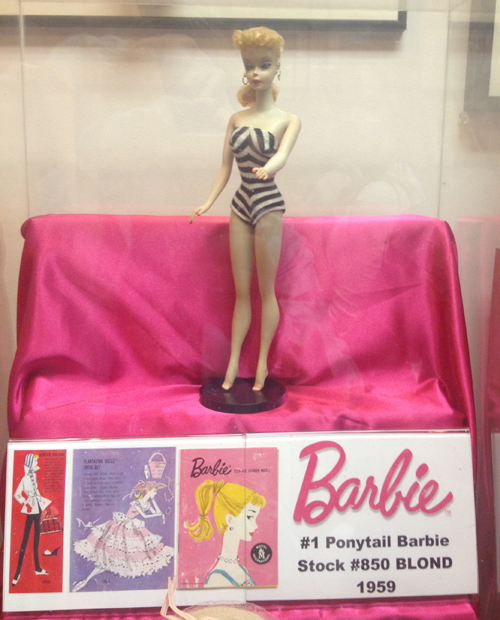 There is also a section of famous toys, and banned toys to view. This Atomic Energy Lab kit Circa 1950’s actually came with four vials of radioactive material to play with. 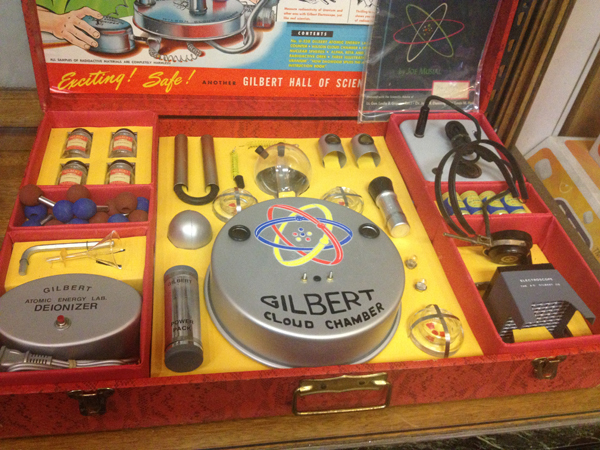 Note the “Safe” advertising on the box. Obviously banned. 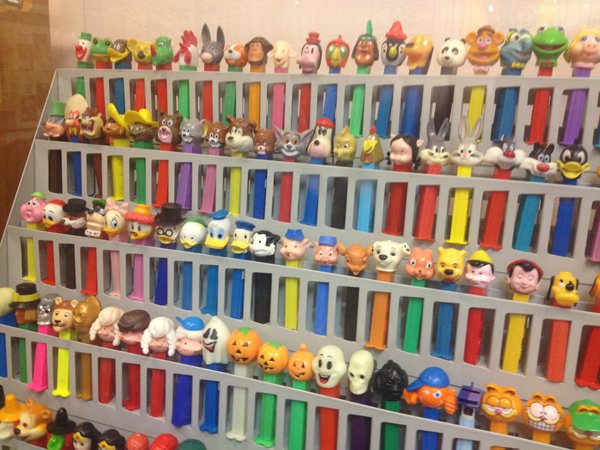 I had been wanting to come to this museum and I was finally here, ready to add some new PEZ to my collection! 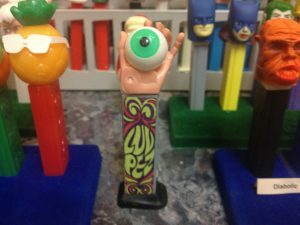 I bought the complete Charlie Brown set (with Snoopy, Woodstock, Charlie and Lucy), Catwoman, and the snowman (replica of world’s largest PEZ). And guess what? 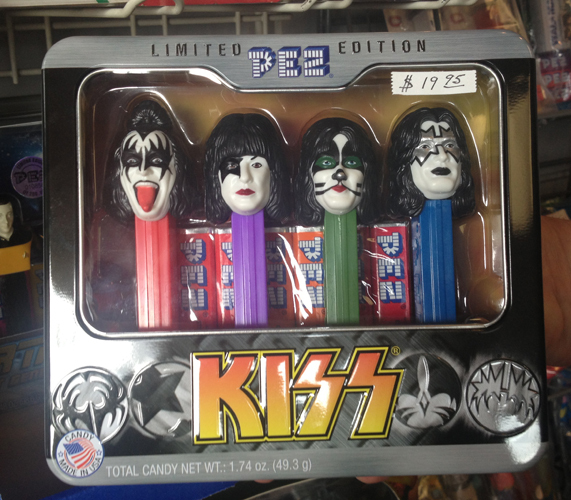 There are PEZ conventions. We rolled into Cambria (2nd thing on my list is the Hearst Castle) and walked the town. My legs were killing me from the flight and car ride – nothing like stretching out your legs to read the local bumper stickers. 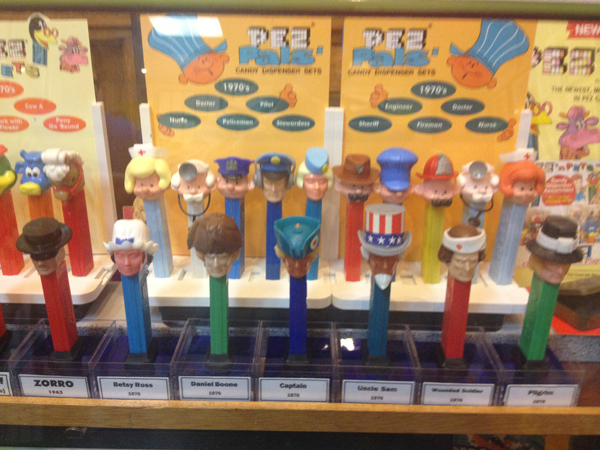 We rolled out of the PEZ Museum and headed south. Jaz argued with Zumo GPS of the trickster clan for about ten miles. I dozed. The scenery was gorgeous as we headed down Highway 101, but I had not slept much since the night before. I hear the phone ring. It is the rental car people calling her to see if she likes the car. Now folks, this has never happened to me. Have the rental car people ever called you and asked you if you like their car? I am convinced they found her driving record, or were monitoring our progress and thought about reminding us we can’t leave the country. She considers asking him how to get the airbag back into the dash after it has deployed, and thinks twice about it. All is good as we pass vineyard after vineyard. I always thought God likes snipers too. I got confirmation in Cambria that it is so. Kicking back blogging with my Blue Suede Shoes. 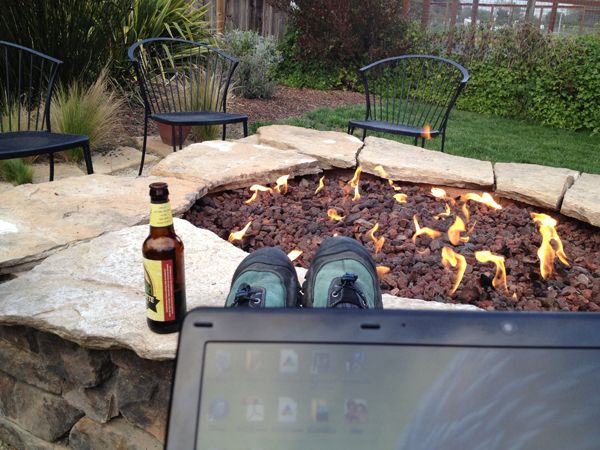 We grabbed some beer, cheese and tapenade and sat out by the fire pit contemplating the palms. Is that you Marilyn Monroe?